Though Huawei is expected to take the wraps off a successor to its Mate 8 phablet in the near future, it doesn't look like we'll be getting it at this week's IFA. Set to roll out during the latter stages of this year, a purported chassis leak has been among the decidedly few scraps of evidence on the eagerly anticipated handset. Some new, leak-based renders have surfaced, which seek to offer a taste of what the Huawei Mate 9 will look like once it does eventually grace us with its presence. Sure, there's only so much that can be gleaned from what is tantamount to fan-made renders. But the images shared by MyDrivers are very close to the Mate 9 visuals we've seen through previous leaks. For example, the aforementioned chassis leak alluded to a dual-rear-facing camera setup above the fingerprint scanner, and these new renders offer a close-up of how this may come together with the final design. 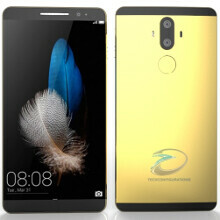 Admittedly, we're not too sold on the black and gold color combo, either to look at or for the likelihood that Huawei will deploy such a finish with the eventual product. But overall, the profile of the would-be Mate 9 is certainly not offensive. As well as the two cameras, which could pack dual-LED flash and laser autofocus, the Mate 9 is expected to go all-out in the specs department. The Kirin 960 chipset is expected to replace the 950 that powers the Mate 8. while up to 6 GB of RAM could also be on board. The display will likely be of the quad-HD resolution, though a full-HD 1080p variant could also be offered at a lower cost. Interestingly, these concept images omit the 3.5mm audio jack as part of an emerging trend in this regard, but this doesn't mean to say that the eventual product will necessarily follow in the footsteps of the Moto Z and Moto Z Force. Whatever Huawei has up its sleeve, here's hoping some of the nagging issues that arose with the Mate 8 don't resurface. In our review of last year's model, we found the camera to be sub-par in a few aspects, such as instability when filming video. There's certainly room for improvement with the display and internal speaker, which, with so many great devices out there for consumers to choose from, cannot be lacking next time around. I find it pretty, to me P9 is OK looking device. Which part of this look slick? Lol. Looks like they are just copying Apple for dropping the headphone jack as well. Chinese OEMs just can't stop themselves from copying everyone. No, it looks similar to last year Axion model. Right, it's Apple's idea to drop headphone jack they're copying in advance. Totally copied Qiku Qterra phone. Lol.